What Makes a Pepper Hot? What Makes a Pepper Hot? Home » Blog » What Makes a Pepper Hot? Capsaicin, a colorless and irritating compound, is what makes a pepper hot. Contrary to popular belief, this irritating compound is contained in the veins of a pepper and not in its seeds. The veins of a pepper are the soft, lighter color connections inside the pepper. These white membranes are known as the pith. 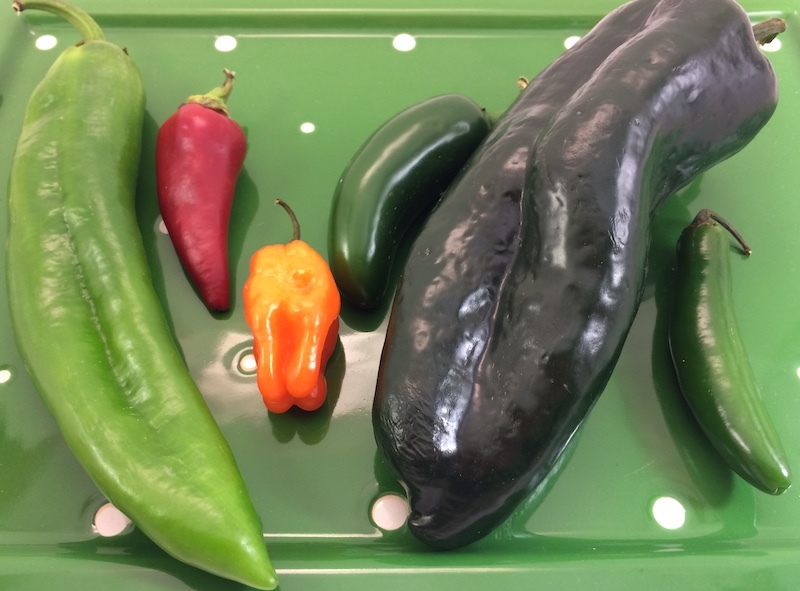 Peppers come in many shapes, sizes and colors just like many other things. But the additional difference that sets peppers, specifically Chile Peppers (also called Chili peppers), apart from many other foods is their hotness level. This invisible variable is what can quickly turn a dish from tasty to unbearable. If you’re ready to spice up your life a little in the new year, then here’s a little help with identifying, picking and using the most common Chile peppers. Where’s the main heat in a Chile pepper? Most people blame the seeds, but actually 89% of the heat in a pepper is contained in the veins, those spongy white sections that connect the insides of the pepper and contain the most Capsaicin! When consumed, capsaicinoids bind with pain receptors in the mouth and throat that are responsible for sensing heat. Once activated by the capsaicinoids, these receptors send a message to the brain that the person has consumed something hot. The brain responds to the burning sensation by raising the heart rate, increasing perspiration and releasing endorphins. There’s actually a scale that measures the hotness of peppers. They’re measured in Scoville Heat Units (SHU). We note these hotness units in the chart below. For comparison, keep in mind that a bell pepper rates a 0 on this scale (no heat) and pure capasaicin reaches 15,000,000 units. Let’s explore some of the many Chile peppers. We’ve ordered them according to heat potential, with the mildest Chile pepper (Anaheim) listed first and the one packing the utmost heat (Habanero) listed last. How to pick peppers: Pick peppers that are firm and have green stems. Store them in paper bags to keep the spices from rubbing off onto other produce. They should last at least a week in the fridge. Warning: Handle all Chile peppers with care. Although they may taste good, it can be extremely painful if any of the Capsaicin gets in your eye (after all, it’s the main ingredient in pepper spray). Remember that the compound is invisible so you won’t know until the pain hits, which is immediately after a contaminated finger touches your eye! It’s best to wear plastic gloves when working with peppers and wash your hands thoroughly when finished. Roast the peppers (half & seed then roast 425°F for about 15 minutes, turning once). 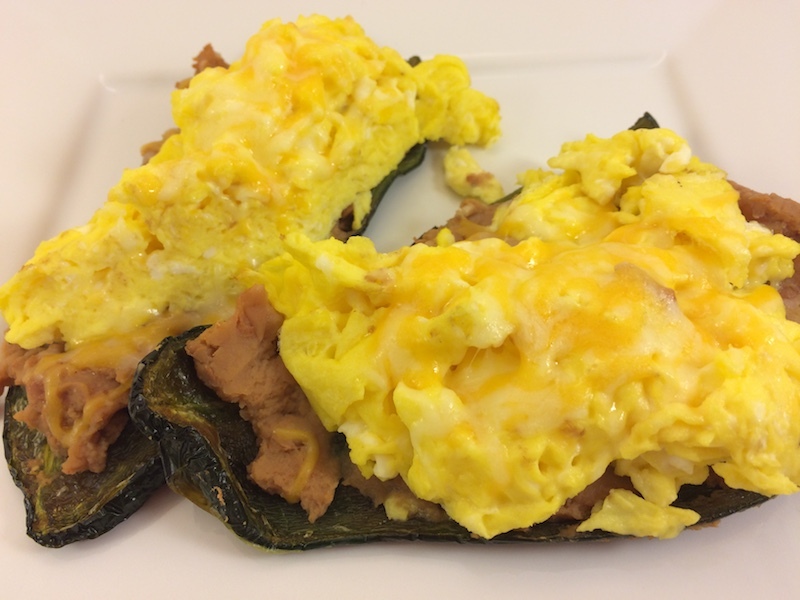 Fill with refried beans & soft scrambled egg, sprinkle with cheddar cheese. Return to oven and bake about 1 – 2 mins. To find out how long bell peppers last, see our pepper page.